While walking pictures taken in Sheffield are quite hard to come by (we have some examples on the site here), similar images of people from Sheffield on holiday elsewhere are more common. I’ve been loaned a few by local people, kept as souvenirs of trips to the East Coast (the destination of choice for Sheffielders for many years), and it’s good to be able to put names to some of the people in walkies when so many others are likely to remain anonymous. The first walkie is one more from Chris Wells’ photo album (there is another shot here). That’s him on the left with with one of those ubiquitous wooden and metal beach spades in each hand (none of the softie plastic stuff for people in those days). His slightly older brother Philip is in charge of the impressive toy yacht, a step up certainly from some of the wooden boats I remember as a child. Chris’s father ran a toy shop in Sheffield, though whether this yacht came with them on holiday or was purchased locally I don’t know. 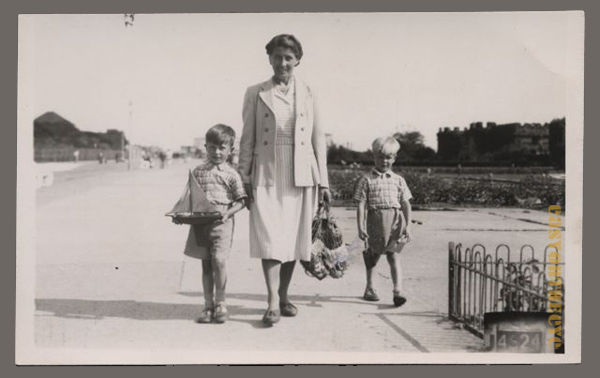 Their mum seems loaded down with what looks like seaside paraphernalia in those string carriers which were all the rage in the fifties. 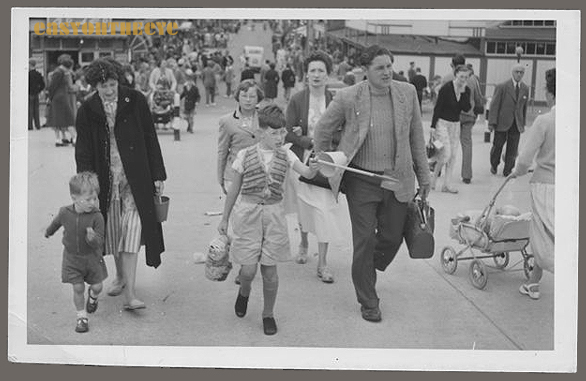 The family were on holiday in Skegness on this occasion, probably around 1954. It could have been taken in the parkland between Alexandra Road and the Promenade. The card is not marked but has a mechanical numbering system in the bottom corner, which provided both a reference number for when you collected the print and a letter, often used to identify the photographer if he was paid a bit extra on sales of prints. Our second walkie is from Diane Coventry, whose Aunt Laura (seen in the photo) was also on holiday from Sheffield. This is a later walkie, clearly taken in Bridlington, by Benson Photos. This firm appear to have started up in the fifties with a shop and lab in Bridge Street near the harbour (and a second operation in Scarborough). Rather than a single card they sold a pair of identical images to the customer, about half postcard size. Looking at the frock we think this must be late 1950s. The third image is from Mablethorpe. I’d hazard a guess that there are more walkies taken on this spot than anywhere else in the UK, for the simple reason that it was the main thoroughfare from the town over the dunes to the seafront; an ideal spot for the walkie camerman. It’s another Sheffield family outing, and was loaned to me by Irene, who is the young girl at the back of the group linking arms with her Mum Edith Thompson (they seem to be the only ones interested in the photographer!). Her brother Alan is in front, and the other couple are here Aunt and Uncle Violet and Alan Ratcliffe, with their young son Graham on the far left. Irene and her family lived in Attercliffe at the time, a busy suburb of the city. 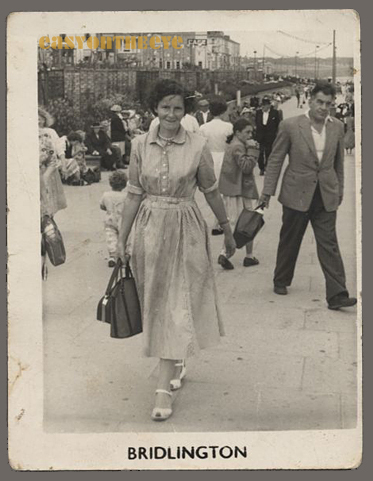 Irene says that by this time they were able to afford a week in a cottage called Takapuna, so named as the owner had been out to New Zealand. She remembers on the last day of one holiday the family were spent up, but on the way to the beach, her Dad found a ten shilling note in the dunes, so they blew it on ice-creams, a donkey ride, and chicken for tea. Despite it being what looks like an overcast day they’re all heading off to the beach, laden down with bags, buckets and spades. 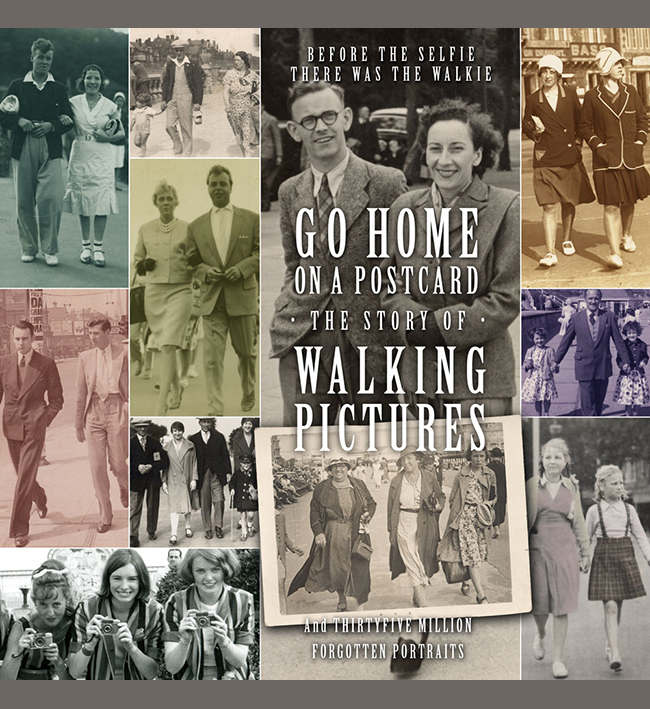 The image was taken by Wrates, the longest lived of the local Walking Picture companies.